Dilated cardiomyopathy (DCM) is a myocardial disease characterised by ventricular dilatation and global myocardial dysfunction (ejection fraction < 40%). Patients usually present with symptoms of biventricular failure, e.g. fatigue, dyspnoea, orthopnoea, ankle oedema. Associated with a high mortality (2-year survival = 50%) due to progressive cardiogenic shock or ventricular dysrhythmias (sudden cardiac death). Can be divided into ischaemic and non-ischaemic. Dilated cardiomyopathy commonly occurs following massive anterior STEMI due to extensive myocardial necrosis and loss of contractility. Up to 25% are familial (primarily autosomal dominant, some types are X-linked) . Viral myocarditis (coxsackie B / adenovirus). 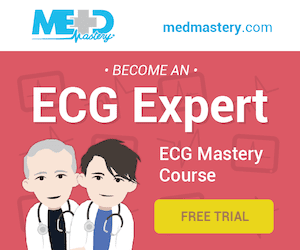 There are no specific ECG features unique to DCM, however the ECG is usually NOT normal. The most common ECG abnormalities are those associated with atrial and ventricular hypertrophy — typically, left sided changes are seen but there may be signs of biatrial or biventricular hypertrophy. Interventricular conduction delays (eg. LBBB) occur due to cardiac dilatation. Diffuse myocardial fibrosis may lead to reduced voltage QRS complexes, particularly in the limb leads. There may be a discrepancy of QRS voltages with signs of hypertrophy in V4-6 and relatively low voltages in the limb leads. 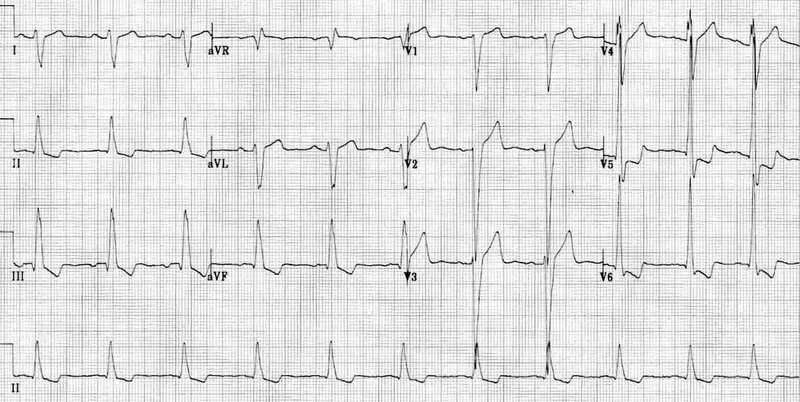 Abnormal Q waves are most often seen in leads V1 to V4 and may mimic the appearance of a myocardial infarction (“pseudoinfarction” pattern). Left atrial enlargement -> may progress to atrial fibrillation. Left bundle branch block (RBBB can also occur). Poor R-wave progression with QS complexes in V1-4 (“pseudo-infarction” pattern). Frequent ventricular ectopics and ventricular bigeminy (seen with severe DCM). Ventricular dysrhythmias (VT / VF). There is marked LVH (S wave in V2 > 35 mm) with dominant S waves in V1-4. Right axis deviation suggests associated right ventricular hypertrophy (i.e. biventricular enlargement). 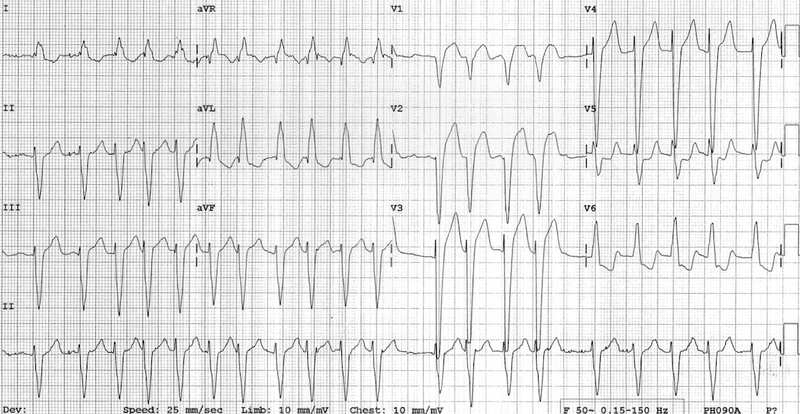 There is evidence of left atrial enlargement (deep, wide terminal portion of the P wave in V1). 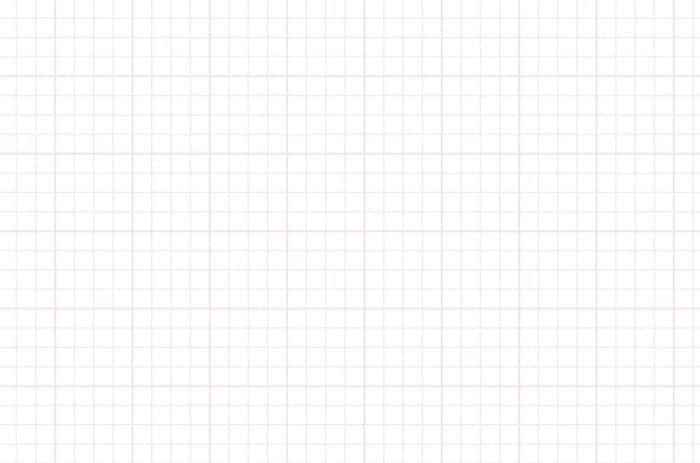 There are peaked P waves in lead II suggestive of right atrial hypertrophy (not quite 2.5mm in height). This patient had four-chamber dilatation on echocardiography with severe congestive cardiac failure (awaiting cardiac transplantation). There is evidence of left ventricular hypertrophy with large precordial voltages and an LV strain pattern in leads with a dominant R wave (I, II, V6). There is also evidence of biatrial enlargement in V1 with a peaked initial portion of the P wave (RAE) followed by a deep terminal negative portion (LAE). The changes of right ventricular hypertrophy are masked by left ventricular dominance; however, this patient had four-chamber dilatation on echocardiography. There is marked left ventricular hypertrophy with repolarisation abnormality (LV “strain” pattern) in V5-6. LV dilatation has produced an interventricular conduction delay mimicking LBBB — however, this is not LBBB as the morphology is not typical and there are small Q waves in V5-6 (the presence of Q waves in V6 rules out LBBB). There are some signs of left atrial enlargement — leftward deviation of the P wave axis (positive P waves in I and aVL, inverted in III and aVF) and prolongation of the terminal portion of the P wave in V1. Right axis deviation in the presence of LVH suggests the possibility of biventricular enlargement. The widespread downsloping ST depression may be due to LVH (= “appropriate discordance”) or digoxin effect (a commonly used mediation in congestive cardiac failure). Atrial fibrillation with LBBB is another ECG pattern commonly seen in DCM. Edhouse J, Thakur RK, Khalil JM. ABC of clinical electrocardiography. Conditions affecting the left side of the heart. BMJ. 2002 May 25;324(7348):1264-7. [PMC1123219].